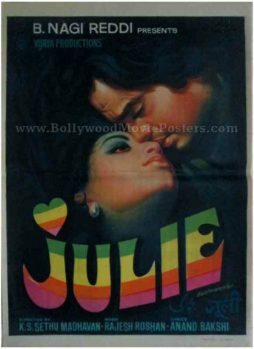 Old Bollywood poster for sale of the hit Hindi film, Julie (1975). This is an actual surviving vintage original Bollywood movie poster of the 1975 romantic Hindi film that starred Laxmi & Vikram in lead roles. The film revolved around the life of an Anglo-Indian family and also starred Sridevi as a child star. Julie is the first film in the history of Indian cinema to feature a complete song in English language, “My Heart is Beating”, making this original Bollywood movie poster, highly collectible. Printed and circulated during the original first release of the film (mid 1970s), this old Bollywood film poster was designed and printed for publicity of the movie but never ended up being used. This old Bollywood poster has been designed by one of the greatest Bollywood poster artists of all time, DR Bhosle and bears his printed signature on the top right hand corner. DR Bhosle's distinct style of minimalism is clearly seen in this old Bollywood poster for sale. The poster features a stunning hand painted portrait of the lead couple in a passionate pose. Set against a dark background, the film's title is seen at the bottom in stunning rainbow colored typography, which is accentuated by the minimalism in the design of this original Bollywood movie poster. Julie was a musical hit, with award winning music by Rajesh Roshan which won him the Filmfare Award for the year. Songs from the film, most notably “Dil Kya Kare” sung by Kishore Kumar are fondly remembered and played till today.